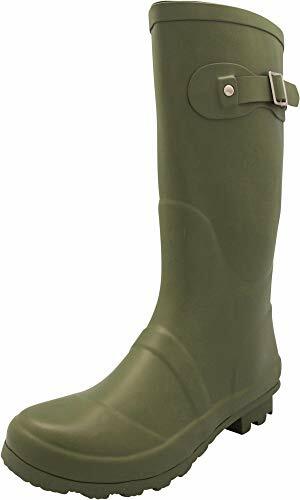 NORTY - Womens Hurricane Wellie Solid Matte Mid-Calf Rain Boot, Olive 40706-6B(M) US | What Should I Say? NORTY - Womens Hurricane Wellie Solid Matte Mid-Calf Rain Boot, Olive 40706-6B(M) US by NORTY at What Should I Say?. Hurry! Limited time offer. Offer valid only while supplies last. Classic, Stylish Rainboots That Fit GreatYou'll find yourself looking forward to stormy, rainy days just so you get to wear your cute wellies. You'll find yourself looking forward to stormy, rainy days just so you get to wear your cute wellies. Feminine styling that comes in 14 gorgeous solids and patterns - all in an easy-to-clean high gloss finish. No matter how wet, muddy, or slick the terrain is, these rain boots come with a nonslip rubber lug sole tread that resists slipping. The 7/8-inch heel and 3/8-inch platform gives your foot stability. Sizes run a half size large so you can layer on your warmest, thickest socks or liners. The 11.25-inch boot shaft gives your calf excellent protection from mud and wet splashes. The natural rubber construction ensures moisture stays out so your feet remain perfectly dry on the wettest days. No need to guess - take a full 30 days to ensure they fit. If they don't meet your expectations, simply return them unworn for a no questions asked refund. NATURAL RUBBER KEEPS YOU DRY: Even on the wettest, snowiest days you can enjoy dry feet. Lined with cotton for comfortable all day wear. Look great in the garden, doing any outdoor chores or even about town. Choose from 14 different rain boots in fashionable solids and prints. MID SHAFT FOR COMFORT AND SPLASH PROTECTION: The 11.25-inch tall shaft gives you comfort and nice coverage so your calves stay protected from splashes and mud. The glossy finish washes clean easily so you always look great. NONSLIP SOLES FOR BETTER TRACTION: Rubber lug slip-resistant tread soles provide a stable platform for your foot - so every step you take is a safe one. 7/8" heel height and 3/8" platform. RUNS 1/2 SIZE BIG: You'll have plenty of room for thick, warm socks or liners as these wellies run a half size large. Calf opening is approximately 14-inches around. NO QUESTIONS ASKED 30-DAY GUARANTEE: No need to guess - take a full 30 days to ensure they fit. If they don't meet your expectations, simply return them unworn for a no questions asked refund. If you have any questions about this product by NORTY, contact us by completing and submitting the form below. If you are looking for a specif part number, please include it with your message.